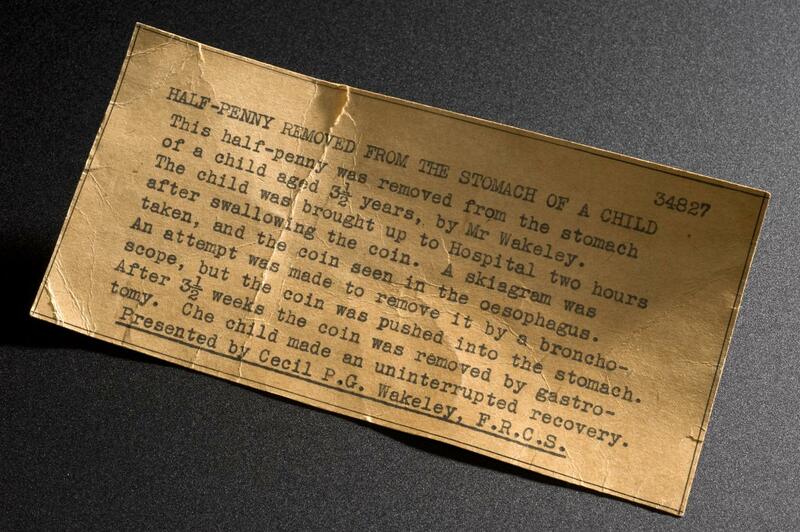 Printed label describing foreign body - half penny removed from stomach of 3 1/2 year old by C. P. G. Wakeley, 1914-1930. 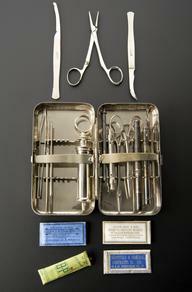 Mounted on mica sheet, held in place with cotton thread or twine inside cylindrical jar, with glass cap, sealing wax andand printed label describing specimen. Two hours after swallowing this coin, a three and a half-year-old boy was taken to hospital. X-rays showed the coin to be in his throat, but attempts to remove it using a bronchoscope merely pushed it into the stomach. The coin was eventually removed 27 days later by surgeon Sir Cecil P G Wakeley (1892-1979). 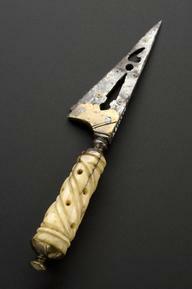 It is one of a number of ‘surgically removed objects’ which have been donated to the Wellcome collections.